MOSCOW — For hundreds of years, mariners have dreamed of an Arctic shortcut that would allow them to speed trade between Asia and the West. Two German ships are poised to complete that transit for the first time, aided by the retreat of Arctic ice that scientists have linked to global warming. The ships started their voyage in South Korea in late July and will begin the last leg of the trip this week, leaving a Siberian port for Rotterdam in the Netherlands carrying 3,500 tons of construction materials . 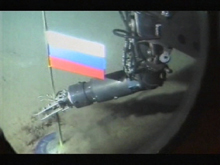 Russian ships have long moved goods along the country’s sprawling Arctic coastline. And two tankers, one Finnish and the other Latvian, hauled fuel between Russian ports using the route, which is variously called the Northern Sea Route or the Northeast Passage. 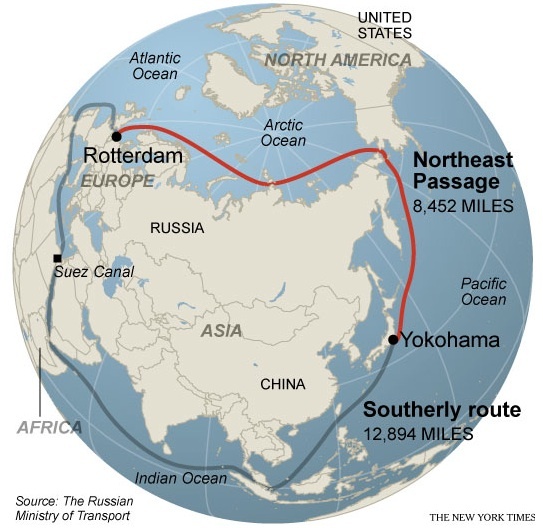 But the Russians hope that the transit of the German ships will inaugurate the passage as a reliable shipping route, and that the combination of the melting ice and the economic benefits of the shortcut — it is thousands of miles shorter than various southerly routes — will eventually make the Arctic passage a summer competitor with the Suez Canal. “It is global warming that enables us to think about using that route,” Verena Beckhusen, a spokeswoman for the shipping company, the Beluga Group of Bremen, Germany , said in a telephone interview. Lawson W. Brigham , a professor of geography at the University of Alaska, Fairbanks, who led the writing of an international report on Arctic commerce, the Arctic Marine Shipping Assessment, confirmed that the passage of the two German ships appeared to be the first true commercial transit of the entire Northeast Passage from Asia to the West. He credited Beluga for taking on both the summertime Arctic waters, which still pose threats despite the recent sea-ice retreats, and Russian red tape, a maze of permits and regulations. “This may be as much of a test run for the bureaucracy as for the ice,” said Dr. Brigham, an oceanographer who is a former Coast Guard icebreaker captain. But he also said it would be a long while before Arctic shipping routes took business from the Suez or Panama Canal. Company officials said the unloading in Siberia of 44 components for a Russian power plant should be completed by Saturday, after which the ships will head to Rotterdam to deliver the rest of the cargo.